"Skeletal bride and groom" is a phrase that may conjure up negative images of women and men starving themselves in order to look great on their wedding day. As I've previously discussed, I've got no patience for a wedding industry that promotes such foolishness. But I'm all about a really tasty skeleton bride/groom white chocolate sucker, which is what we gave as favors at our wedding. Once again, Mexican Sugar Skull was an awesome resource for the chocolate molds. I got the chocolate from Sanarak Paper & Popcorn Supply, a little wholesale shop in Buffalo that doesn't have a website. My mom and I made 150 of these suckers- it took several days, since we only had 3 molds and could therefore make a total of 6 suckers at a time. 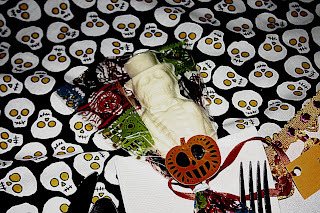 My mom was working on the fondant-decorated skulls simultaneously.